Knit, Lola, Knit: "Wicked" Mail! 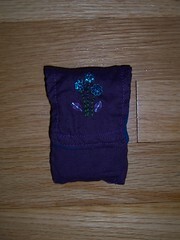 It's got cute little beaded flowers on the front and even has a button hole on the bottom so I can plug in my earphones. 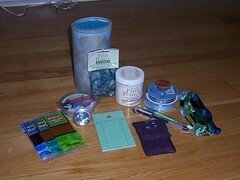 There were also tons of other cool things like fruit leather, ribbon, beautiful beaded stitch markers, paper paint, library check out cards, playing cards, gel pens and embroidery floss. It was so fun to keep pulling out one amazing thing after the next. I just hope my swap package lives up worthiness wise to this one! Wow. The other packages weren't quite as exciting but one was the free memory card and the other two were Betsy-Tacy books to complete my collection. 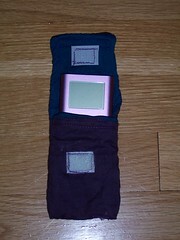 I got them used online for like $.20 cents each and I'm going to bind the whole collection in matching cloth! What a wonderful day! 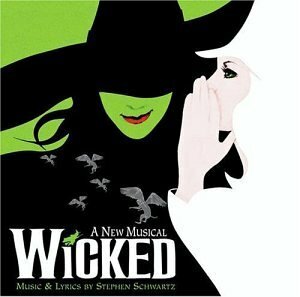 Lately all I've been listening to is the CD from the new musical "Wicked". It is amazing and I want to see this sooo bad. It's the story of Oz before Dorothy, kind of a look at how the Wicked Witch of the West and Glinda the Good Witch became who they are. I really recommend it to everyone I know. It's just great. It's going on tour too, so check out their site. It's also based on a book called Wicked: The Life and Times of The Wicked Witch of the West. I hope to read it soon since it's hard to tell exactly what's going on with the story when you only get snippits of it through the songs. Even then, it's still worth listening to!